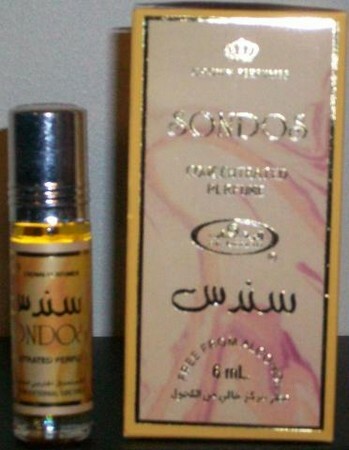 Sondos opens with a very strong oud note, so beware if oud doesn't agree with you. Eventually this perfume oil fades to a powdery rose. Very strong sillage an longevity, too. Sondos is a potent mix of Sandlewood and Damascus Rose. However, the Rose chosen is more distinctive and creates an spectacular aroma when blended with sandlewood. You get a sweet musk smell with added sophistication. ...World Famous Al-Rehab Luxury Perfumes. The Sultan of expert craftsmanship, expertise in Middle Eastern-Oriental Attars and innovative blends of pristine quality. Featuring high grade super concentrated perfume oil where price is never an option! Sparkling and luminous aldehydic rose with crisp, green florals lending support, over a chypre base of oakmoss, amber, sandalwood, patchouli, and musk. Reminds me of vintage Animale Animale. Strong sillage, great longevity. Quite lovely. Strong, in a good way. A very strong, masculine Sandalwood Rose mixture. A little goes a long way. Very nice.